Does Hedman 69820 fit your vehicle? 69820 is rated 4.2 out of 5 by 5. 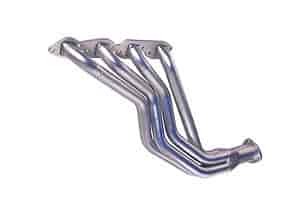 Rated 5 out of 5 by Woods from Great The headers fit great on my 88 Fleetwood p30 chassis motor home, have thick flanges and so far my motorhome runs much better and has no leaks. Rated 5 out of 5 by 87ramjet blazer from ordered for an ongoing project but first blush they are exceptional. They look great, came with all instillation hardware and bolts. I am looking forward to getting this together. Rated 5 out of 5 by 1976 C20 from Functioned as advertised I installed a set of Hedman 69820 in my 1976 Chevrolet, C20 , ZZ502/502 engine with standard 1976 BB/SB Starter motor and 700R4 transmission. They fit perfect in the truck but as advertised the header flange did make contact with the top of some head bolts requiring a little grinding. so far I have only had to re-torque the header bolts once due to the improved gaskets that came with the headers. As advertised the coating on the headers did discolor at some of the bends due to the heat the NEW 502 can develop. Due to the packaging the headers came out of the box damaged , the machined edges on the flanges scratched and gouged the tubes near the collector. but JEGS gave me some money back for repairs. Rated 1 out of 5 by GKindiana from Rusted Bought several years ago. Started rusting right out of box. Ceramic coating garbage. Not worth extra money for costing. Looked great at first except mechanic pointed out specks of rust around weld areas. No I dont recommend the cermanic coating. Maybe I got a bad pair. Not a problem with Jegs! Yes, this is the correct header for your class A motorhome.